SEASONAL / LIMITED EDITION. 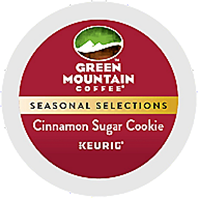 Enjoy the taste of warm cinnamon sugar cookies right from the oven with Green Mountain Coffee’s Cinnamon Sugar Cookie K-Cup Packs. The warming aroma and taste of cinnamon is the perfect morning wake up or indulgent evening dessert. This seasonal selection is fair trade certified.